In 2009 I started to paint again, I had fun with it, tried some ideas and even though I only produced two paintings which felt finished to me, that's two more than the year before! Aberdovey started off on a sunny afternoon, R and I had been joking about our different styles and I challenged him to leave the one hair brush and have a go with my palette knives. I had a go at the same time, became absorbed and this painting emerged. It was inspired by the photographs from our trip to Wales immediately after leaving our full time teaching jobs. We stayed in Tywyn and it was lovely to pootle along the coast where I had lived for four years when I was studying at the University of Wales, Aberystwyth. That was well over a year ago and I am very ready for living near the sea and painting again, no more move news yet, we are awaiting another survey man who will hopefully be the last! 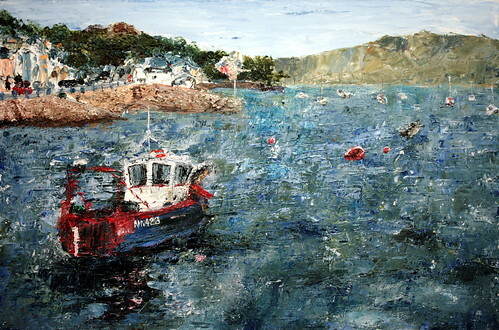 The painting is great, gives you a really strong sense of the choppy sea - You should paint much more! Thank you for submitting your photos to the Craft Blog UK Flickr group I have just used one in a new post. Moving to live near the sea. That's my dream. Lucky you! I was in Aber for the first time a year ago for an International Ceramics Festival. First thing I did was go and stand in the sea and collect pebbles and seaweed! To hell with the ceramics - the sea has a bigger pull.